Today kicks off American Craft Beer Week! In the American Spirit...we declare independence from drinking horse piss! 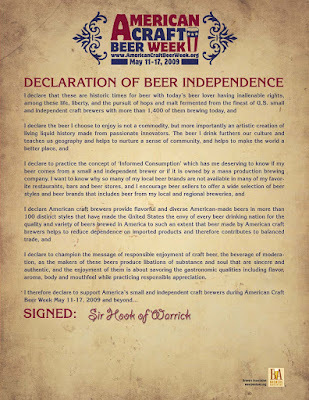 So, my fellow Colonial Knights of Moleskine, Spirit and Ale...let us unite with our better beer brothers across the pond and drink as our fore fathers once drank...one tankard of craft brew at a time! Calling all Knights and Ladies of the Realm in the vicinity of Columbus, Ohio...Sir Hook's Traveling Medicine Show is making a stop there this weekend. Come join me at the Dublin Village Tavern Sacred Watering Hole this Saturday at 7pm to Celebrate American Craft Beer Week with Craft Brews, Stories and Laughter at the first Council of Dublin! Bring your friends, family and all potential new recruits. Cheers! I surely do hope the hubs and I will be able to make that Dublin meeting! Our eldest will be at a dance (with a BOY) on the other end of town at that time, so we'd need to make sure coverage of that was sufficient before heading to Dublin. Fingers crossed! Went to open up an application on Friday and it wouldn't open. In fact, not one application would open up. So, she's at the PC doctor with a nagging little voice in the back of my memory card whispering "Get a Mac!" So, tonight after work, I'm heading to pick up my 1964 Buick and taking a drive to a store and picking up a few unusual craft beers. Thanks Sir Ds for excellent blogs the past few days. Lady Tammy...hope to see you there. Sir Bowie..glad to hear from you! Remember...once you go Mac you never go back!